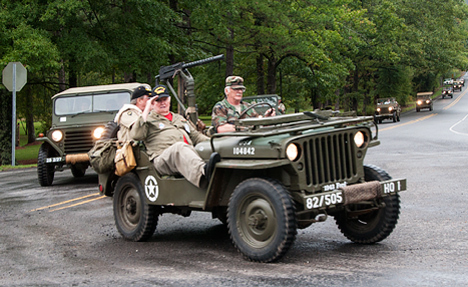 Here's how it looks as you are tooling down the road in a M38A1, the third generation of military jeeps, which began service in the military in 1952. Note the abundance of open air and lack of what are now considered civilized amenities, and three gear shift handles. From left to right these are: transmission, four-wheel-drive in or out; and four-wheel drive, high or low. You will not be tested on this, but thousands were during the long service life of this hardy vehicle. Fond memories and tall tales abound with it. This 1944 WC 44 ambulance was built in on what is popularly known as a "Dodge Power Wagon" chassis. It would carry four stretcher patients or six walking wounded. Michael Penny of Poplar Bluff MO is the owner. 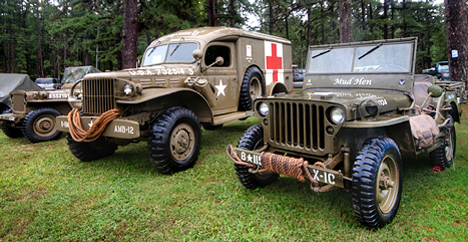 The 1943 jeep in the foreground was manufactured in WWII by Ford Motor Co. The recessed headlights are the giveaway hint in the jeep's provenance. Several other automotive manufacturers also built jeeps. Paul and Ev Harless of Ada Valley AR are the owners. 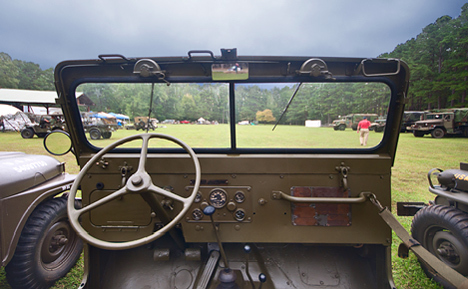 There was a good variety of vehicles including the old faithful “duce-and-a-half,” jeeps of many vintages including an MP version, three ambulances, some wheel mounted guns, a WWII US Army Harley Davidson, and other miscellaneous and sundry wheeled vehicles and military artifacts. Unlike most museum grade pieces, it was ok to touchy-feely-crawl-around on most of them. And ride in them to boot. And ride we did. WWII veteran Jack Brannon of Thayer MO briskly renders the hand-salute as his ride rounds the clubhouse turn near the end of the convoy. His props his foot on the right front fender, the de rigueur position for passengers in this model of jeep, much to the disdain of military police and commanding officers. His driver is Kenneth Brown, also of Thayer. What’s the use of having a vehicle and not driving it? And if it just happens to be a military vehicle, why not a convoy? And yea, verily, following that concept, the participants formed a convoy and we tooled around the top of the mountain, stopping once to gaze at what is normally a fantastic vista, then socked in with fog. Fortunately, as I was making my descent, the haze lifted. The view was spectacular. 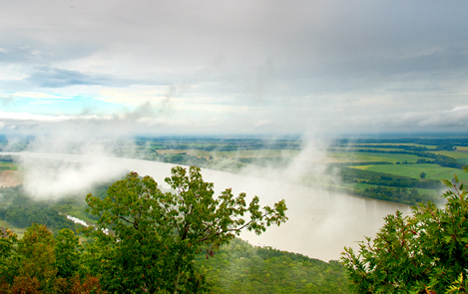 Looking at the Arkansas River, still misty from a recent rain, from the top of Petit Jean Mountain at an observation point on the east side of the mountain. Patience paid off. The collectors and restorers of this organization do a good job of preserving a valuable part of our history not only as restorers, but as researchers and historical advocates. For that we should be grateful. And we are. Every week we shoot more pictures than we can post, so we put those suckers up in a high resolution galleries, one for folks with a PC and one for folks with Macs and I-Phones. This week there are 19 bigger and better pictures from this event, including another Harley shot, some convoy pictures, and another “view from the top. For PC, click here. Mac, I-Phone or PC, click here. An impromptu band at a recent Memphis Blues Society jam session bears a resemblance to the Lil' Ol' Band from Texas, ZZ Top. Their music, vintage blues, played with primordial passion, crawled into my person. I welcomed the visitation. 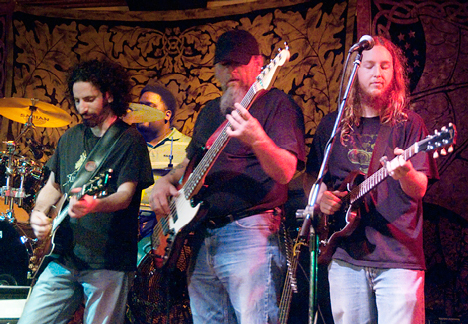 Musicians, left to right: Greg Gumpel, guitar; Brian Wells, drums, "Evil," bass; and Josh Roberts, guitar. Blues, one of the few unique American art forms, according to numerous denizens of Memphis, got its start in their fair city. Nearby, their Mississippi brethren will probably argue that the birthplace was a few miles further south. Most of the rest of us acknowledge that the beginnings were in the neighborhood of both. Thank goodness I don’t have a dog in that fight. I just love the music and could care less about the geography thereof. Before we venture further, this treatise got its start on the Photo of the Week page at Corndancer dot com. Click here to go there and see a couple of blues pictures and read about the blues experience. 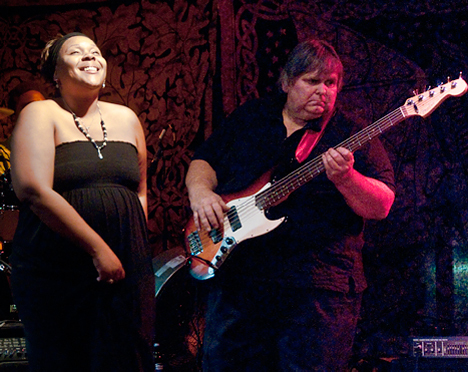 Memphis blues singer Red Velvet is accompanied by bass virtuoso Leo Goff in the soon to be legendary September 16 Jam Session of the Memphis Blues Society. Speaking of which, the September 16 Memphis Blues Society jam session which I attended was one of those rare events for which the stars, the moon, asteroids, the shifting winds, the Mississippi River flow, the smog level, the mosquito reproduction rate, and the ghost of W. C. Handy all come together and sprinkle Neil’s Bar and Grille with blues pixie dust. Having breathed deeply of these unseen cosmic colloids, a hastily assembled, impromptu band held forth with a toe-tingling music session to remember. The audience, similarly entranced swayed with the tunes and lyrics. Especially the one couple on the dance floor clinging to each other and moving as one. 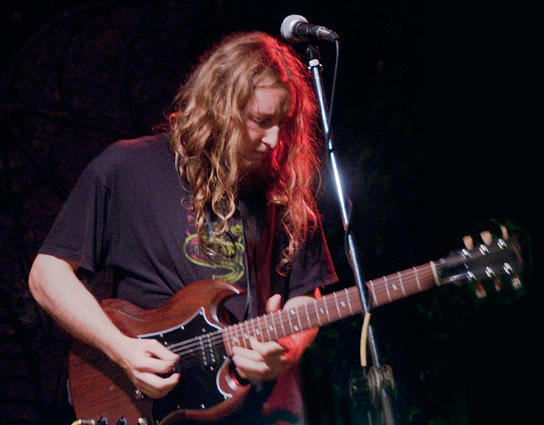 At the ripe old age of 13, Josh Roberts first laid his hot little hands on a guitar. It was like bacon and eggs, 'taters and gravy and, or coffee and a cup. They were simply meant to be together. As his fingers negotiate the fretboard like a spider and he plucks the strings with frenetic energy, the blues spew forth and wing their way around the room. Every week we shoot more pictures than we can post, so we put those suckers up in a high resolution galleries, one for folks with a PC and one for folks with Macs and I-Phones. This week there are 19 bigger and better pictures from this event. PC, click here. Mac, I-Phone or PC, click here. For a lot of us, the sound of an aircraft engine is a hair-raising thrill. Not the jets, the reciprocal engines — the ones with pistons. The ones that cough, sputter, and smoke when they crank up, then roar to life with earth-shaking presence. The ones that convert gasoline to excitement. See how this story started and take a look at a magnificently restored Howard DG 15A airplane on the Photo of the Week page at Corndancer dot com. Click here, to go there. Had you been at Grider Field in Pine Bluff, Arkansas Saturday, September 11, 2010 you would have received a liberal dose of all of the above. 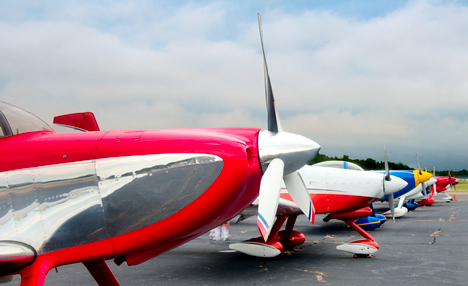 The event was the Third Annual Fly-in put on by the Razorback Chapter (1388) of the Experimental Aircraft Association. The event is open to the public and the welcome mat is out for aviators of every stripe to fly in and enjoy the show. 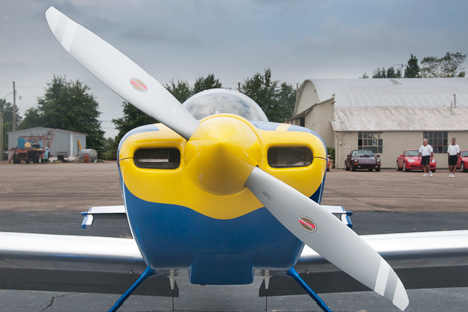 RV aerobatic kit planes are serious aircraft powered by 160 to 200 horsepower engines. Pilots of the aerobatic team, Falcon Flight, exclusively fly “RV” aircraft, a popular aerobatic plane which users build from kits. According to local EAA members there are more than 8,000 of these craft actively flying in the nation with at least twice that number in the process of being built. The kits are supplied by the Van’s Aircraft Company of Aurora OR. The “RV” moniker comes from the initials of the plane’s developer, Richard VanGrunsven. Kits come with everything needed except the engine. Most engines used for the aircraft are in the 160-200 horsepower range. The airplanes are fully aerobatic capable and do not need long runways to land or take off. A really nice tail. 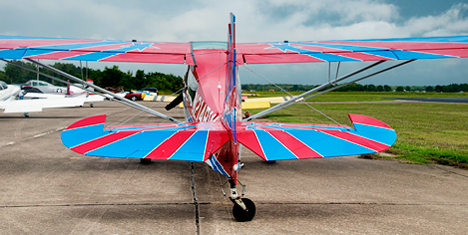 This aerobatic plane was on display at the fly-in, but did not participate in the air show performances. Good paint! Chapter officials also invite area car clubs to participate in the show as well. There were upwards to 100 Porsches, MG’s and a healthy representation of other sports and rare cars in attendance. They arrived in convoys and probably raised a lot of eyebrows on the trip to the airport. I was derelict in not shooting more of the fine cars at the show. 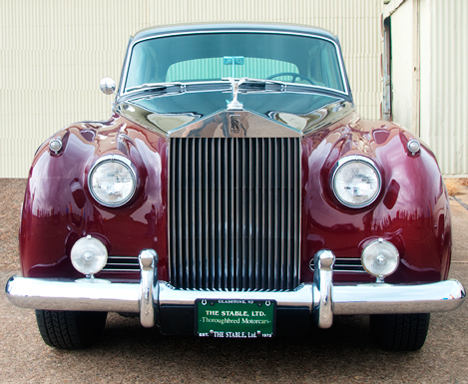 I could not resist this Rolls Royce however. It looks almost ready for the Queen of England. EAA members at Grider Field, in many cases, perform maintenance on their aircraft in the chapter hangar. The hangar’s assemblage of aircraft is tantamount to a museum collection. Presently there is a Vultee BT-13, an old Army L-19, and a small bi-plane residing in the hangar. There is also a WWII trainer, a Fairchild PT-19 undergoing restoration. Grider Field was established in WWII as a pilot training facility, the PT-19 was one of the aircraft used in the training program. Vultee BT-13 undergoing maintenance in the Grider Field EAA hangar. aircraft for an aerial photography session. Get a passenger view of the innards of the BT-13 here. Take a look at what we shot while in the air here. After a rain scare came and went, the flight of aerobatic planes cranked up, took off in formations and put on an impressive show of precision flying. Team pilots bring some impressive flying credentials to the table. Team members are former US Air Force pilots and commercial airline pilots. The show was impressive. Their show completed in Pine Bluff, the Texas-based Falcon aerobatic team flies toward Kansas for their next engagement of the day. No doubt, they will thrill folks there just like they did here. I managed to get a “blind hog finds acorn” shot during the show. 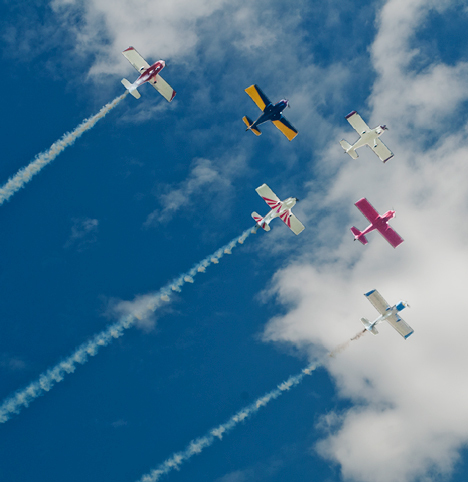 As the team was flying away from a pass over the spectators, the number five guy, the one in the back aligned with his partner at the top of the formation to give the impression of a two-tailed bi-plane. Fortunately, the Nikon shutter clicked at just the right time. I had no idea I had the image until I saw it on the screen. The Lord continues to take care of fools and drunks. The picture is below. I’d rather be lucky than good any day of the week. See bigger and better versions of these and more airplane pictures in our weekly high-resolution gallery. Click here to go there. If you are looking on an I-Phone or a Mac, click here. 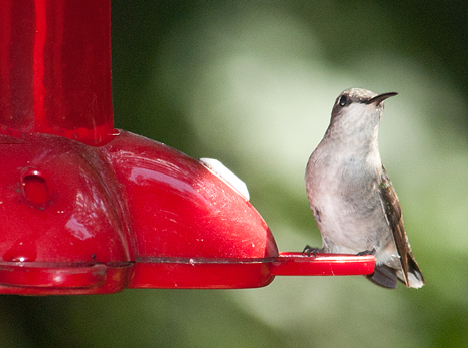 This female Rubythroated Hummingbird is looking at another hummingbird just out of the picture. The exchange between the two is far from friendly. For all of their outward appearing sweet innocence, many hummingbirds demonstrate some marked violence among their community members. We took a good look at this behavior in our hummingbird epistle on the Corndancer dot com Photo of the Week page. Click here to go there and see a couple of hummingbird pictures and read the revealing prose. We’ll wait here while you do. The hummingbirds are a seasonal part and parcel of the Chez Dempsey menagerie. The roster includes domesticated critters in Cleo, Yoda, Cocoa, and Ruby, canines of various persuasions; and Kodak, Katy, and Chessie, felines; and a supporting cast of wild beasts including squirrels, small birds, and a respectably sized short-eared owl, who, in fact, “belongs” to the entire neighborhood. It is truly a zoo. And a veterinary bonanza. 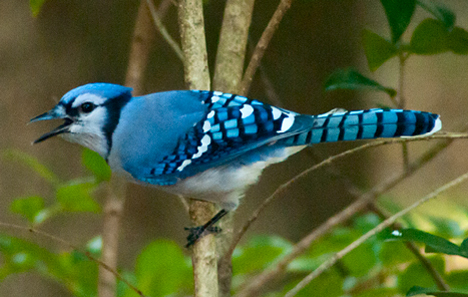 This Blue Jay, aka, "jay-bird," in correct southern parlance, is giving a piece of his mind to a squirrel approaching the bird feeder. The squirrel could care less. We attempt to feed the birds, which is a de-facto donation to the squirrels’ nutrition plan. 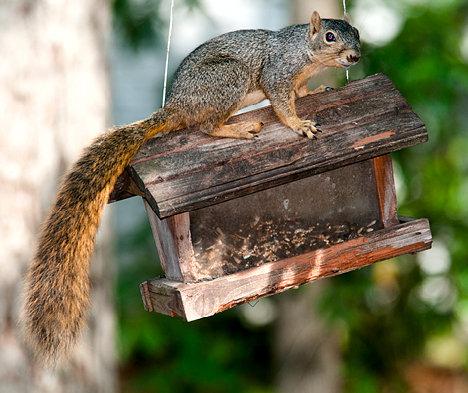 It would take a bird feeder with the security of Fort Knox to successfully deny a squirrel what he or she deem to be their fair share of the food largess. Sooner or later, they would breach even that, I do believe. 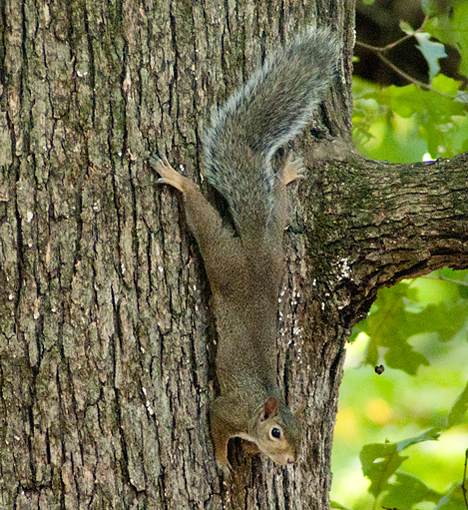 The invading squirrel slithers down the tree as she approaches the bird feeder. Said squirrel callously ignores the cacophony created by nearby birds as the food attack proceeds. When the squirrel arrives at the feeder and initiates satiating her voracious appetite, she becomes an unwitting food distributor. Squirrels have table manners somewhat akin to those of fabled barbarian, Attila the Hun plus a horde of hungry Vikings. As she munches away, she ejects bits and pieces which shower to the ground. Wrens, chickadees, sparrows, and other small birds migrate to the impact area and happily peck away at the tidbits. Now properly ensconced and in charge of the mess-hall, sister squirrel surveys "her" fiefdom. Numerous birds take serious exception to this cavalier attitude. While the critters take this nutritional war to heart, us humans enjoy their shenanigans for entertainment value. On many occasions it surely beats what is on the tube. And also gives us pause to consider what behavioral shortcomings we may share with the critters. Each week, we shoot more than we have room to show. So we put all shots, the ones we post and the “picks” that weren’t posted, in a picture-only high-resolution gallery. The pix are bigger and better. Click here to go there.